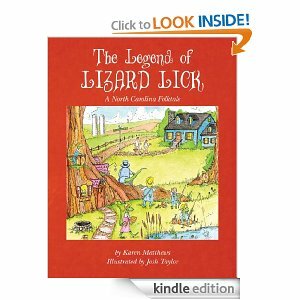 Today we have a special treat for all people fond of the Old North State as we review The Legend of Lizard Lick by Karen Matthews. This is written and illustrated to be a child’s book however I was the second in line to read this. I beat one of the children to the book. Let me get this out of the way that both children give it two thumbs up and are still running around days later mentioning parts of the story. I can certainly say that it does a great job meeting children’s expectations. I was very impressed as well. North Carolina has some great towns that have unique names and Lizard Lick is no exception. It is quite well known now thanks to a well know television show. I am still not sure where it got it the name despite going to a restaurant that my Uncle owned in town at one time. I am pretty certain the story that Mrs. Matthews relates is not quite the exact way but is very good tale. The story that she brings is fantastic and I loved reading about the different characters and found myself rooting for them in the story. The illustrations are superb and even the youngest reader will enjoy flipping through the pages. If you are looking for a great read with a very good message then this is one that you should put on your Christmas list. I hope each of you add this one to your Christmas list and hopefully this is not the last we will see from her.